Three of us spent last week in Chicago at BERNINA headquarters and our heads are filled to the brim with information. It was a wonderful training experience. BERNINA really has it down when it comes to educating their authorized dealers. Leave it to the Swiss to make sure every little detail gets the attention it deserves! Our initial shipment of sewing machines and accessories are arriving at the shop this week and we'll be spending the next several days getting our new showroom set up. With that in mind, there is still quite a lot of clearance fabric in our back room that we need to send home with sewers and quilters, so THIS WEEK ONLY TAKE AN EXTRA 15% OFF OF ALL FABRIC CURRENTLY ON CLEARANCE. One yard minimum during this special offer. We're very excited about adding the BERNINA line of sewing machines and accessories to our shop and, as always, we appreciate your continuing support. We have so much planned for 2014. Stay tuned and join the fun! P. S. Save the date . . . we'll be having a BERNINA open house on Saturday, March 1. Demos all day, door prizes, and much more. Mark your calendar for this event (more details will be in the next newsletter), but don't wait to to stop by to see our selection of sewing machines later this week. If you participated in the Mystery Quilt program that wrapped up recently (and even if you didn't but just want to see all the beautiful quilts) you’re invited to the Unveiling Breakfast on Saturday, February 15th from 9 – 10 a.m. Bring your finished quilt and take a bow! Thursday, February 20 – Third Thursday Demo – 12:30 p.m.
Join us for our regular Third Thursday Demo when Cindy Dahl and Beth Cardozo will team up to show what can be done with the new Creative Grids Hexagon Trim Tool ruler. 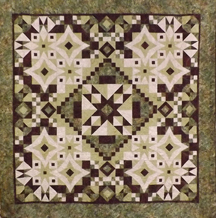 Create perfect pieced hexagons with 2in, 4in or 6in finished centers by squaring up each round of strips as you go. Since each round is squared up before the next set is added, the blocks created are perfect hexagons. Or use the markings to cut 2in to 8 in finished hexagons & every size in between. 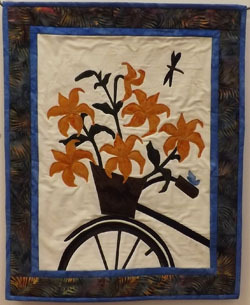 Friday, February 21 – Quilt ‘Til You Wilt – 5 – 10 p.m.
Sign up today for this popular evening event. Bring whatever you’d like to work on (one of those UFOs maybe?) and enjoy the company of other quilters as you sew into the evening. Great way to wrap up a busy week. Bring your dinner or order out from one of the many nice restaurants nearby. Call 970-565-7541 to register as space is limited! We have one (yes, only ONE!) space left in the Asteria BOM program and it's in the blue/purple colorway. For those of you who have already signed up, we have several bolts of coordinating backing fabric for both colorways available. If you would like to go ahead and get your backing fabric come in THIS WEEK ONLY to receive 10% off. First come, first served. Some of the bolts are batik "basics" that we can re-order so no pressure. But if you'd like to see what we have in our "backing stash" now and receive the discount, stop by the shop soon. After this week, any remaining bolts will be put on the shelves at regular price. Hand applique is fun, relaxing and you can watch movies without guilt as you stitch away! 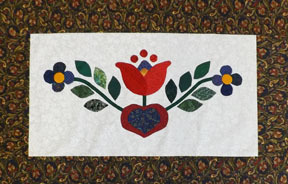 Spend the day with guest teacher Patricia Joy learning the art of hand applique. You will learn more than one technique for applique that will take away the fear of those corners, narrow stems and perfect circles. Applique is easy and there are times when it is the best technique to use in your quilt project. A few secrets about thread, needles and stitches will send you on your way to award winning finished work. Is your sewing machine due for service? We are now certified to service all BERNINA sewing machines as well as other electronic machines that are no longer under warranty. Our standard fee for a clean/oil/adjust will be $69 for most sewing machines. Next week on February 19 and 20 we'll be offering this service for only $49. At this special rate we're taking 20 machines in for those two days. Call us TODAY at 970-565-7541 if you'd like to sign up to bring your machine in and take advantage of this special pricing. 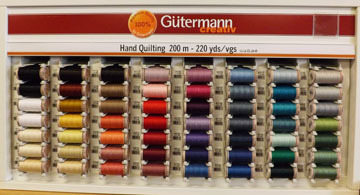 We just received a 50 color assortment of Gutterman hand quilting thread. Who hand quilts anymore? Lots of people! Even if you don't, this 40 weight thread is excellent for sewing on bindings, sewing on buttons, beading, and other types of hand work. $4.50/spool. Thank you to the more than 30 customers who donated a total of 400 items for our local food bank, the Good Samaritan Center. Cortez Quilt Company matched the donation with another 400 items. 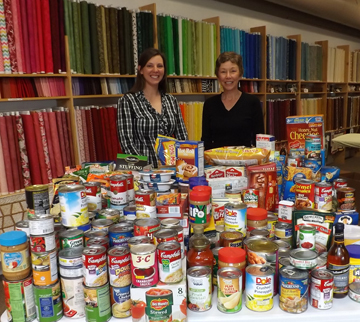 Pictured here is Good Samaritan Center Director, Kristen Tworek and Karen Childress, CQC owner with stacks of food. Have you ever dreamed of making one of the wonderful Bigfork Bay Cotton Company wildlife applique wall hangings, but dreaded picking out all of those little pieces of fabric. Well, we've just made life easier for you! 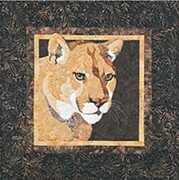 Cyndi spent about a week recently making kits for several of these wonderful patterns. Come check out the full selection at the shop soon.